The WCC 9th Assembly will offer a diverse and innovative programme for the expected 3000 participants from virtually all Christian traditions and regions. 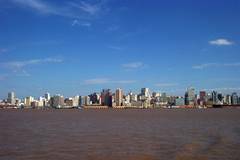 The moderator of the international planning committee which is preparing the event, Norman Shanks from Scotland, explains how the 14-23 February 2006 Assembly in Porto Alegre, Brazil, will work. The Assembly programme will be both creative and diverse, and participants will have countless opportunities to interact and share insights out of their own experience. 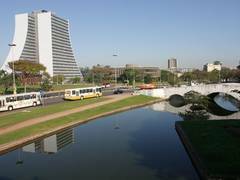 Porto Alegre is an attractive and dynamic city and the Assembly venue, the Catholic Pontifical University (PUC), offers a modern campus and meeting centre. 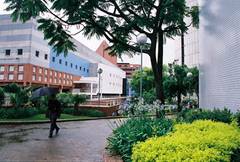 The University has impressive experience in hosting major international events, not least the World Social Forum, attended by around 30,000 people. By comparison, the WCC Assembly will be smaller: we expect up to 1200 "core participants", including church delegates and representatives of related organizations, and up to 1800 others - visitors, ecumenical partner agencies, student groups, and so on. the earth, our societies, our churches, our lives, our witness." The worship at the gathering will nourish and guide the entire life of the community, and is certain to be a memorable feature of the Assembly experience at Porto Alegre. Each day will begin and end with prayer in the large worship tent, with liturgy and music drawing from a wide range of church traditions. Additional services will be offered at other moments during the day. After morning prayer, delegates will gather in small Bible study groups to reflect on Scripture and share insights and experiences. Other participants will be led in larger-scale Bible reflection. During three days of the Assembly, delegates and youth participants will engage in "ecumenical conversations", choosing from topics of relevance to the life and witness of the church in today's world, each reflecting an aspect of the changing religious, cultural, ecumenical, social and political landscape - from HIV/AIDS to the challenge of racism, from mission and evangelism to information technology and bioethics. Plenary sessions devoted to specific themes: economic justice; Christian identity in a pluralistic world; church unity and the future of ecumenism; youth overcoming violence, will be at the centre of the programme. 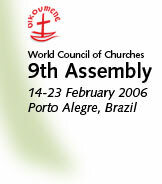 A series of business sessions, building on recommendations by committees of delegates that will meet throughout the Assembly, will reflect on the work of the WCC since the 8th Assembly in Harare in 1998, hearing reports from the moderator of the central committee and the general secretary, amending the WCC's constitution, adopting an Assembly "message" and statements on significant public issues, and formulating priorities for the Council in the coming years. This being the first WCC Assembly in Latin America, the programme will engage with the regional context through the involvement of local churches, national and local ecumenical bodies, and through the expected participation of many visitors from the region. A special "Latin America day" will be a highlight of the week, and will combine prayer, presentations and a cultural evening devoted to the region. The planners hope that the 9th Assembly will qualify as a youth assembly, with the active and visible contribution of the youth delegates and the many stewards, and through the life of a special Assembly youth camp that will host young people from Latin America. A pre-Assembly event will prepare the youth participants, and there will be similar gatherings for women and members of the Ecumenical Disabilities Advocacy Network. A Portuguese word, "mutirão" - that implies gathering, sharing, and acting together with a view to "making a difference" - has been chosen to describe the space for sharing and exchange provided for all members of the Assembly community. It will be a specific part of the programme: each day, participants will propose dozens of workshops, as well as displays and exhibitions, cultural and artistic offerings and opportunities for other forms of ecumenical learning. I have no doubt that the WCC's 9th Assembly will be a life-shaping and -transforming experience for all those involved as well as for those who will be accompanying the event. My prayer is that all may be open to the grace-filled, graceful possibilities that the Assembly offers, and that the experience and decisions will permeate, influence, enrich and transform our churches and our world. "God, in your grace, transform the world!" (*) Rev. Dr Norman Shanks is minister of Govan Old Parish Church, Glasgow (Church of Scotland). He was a member of the central committee elected at the Harare Assembly and is moderator of the Assembly planning committee.